This is an easy recipe for delicious sweet and buttery yeast rolls. 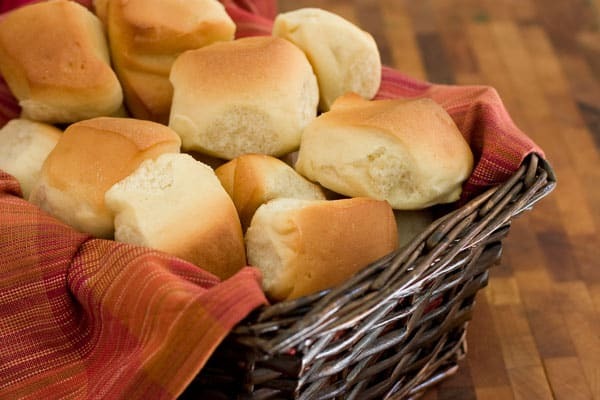 Nothing is better than a freshly homemade dinner roll. We had these rolls on Easter. They make a perfect accompaniment to any special dinner, especially a special Sunday dinner. What’s great about these dinner rolls is that you can also make them ahead of time. You can refrigerate them for up to 24 hours or you can even freeze extra dough for up to 2 months. You can also make these rolls seedy by adding seeds of your choice to the dough, or simply brushing the tops of the rolls before baking with an egg wash and sprinkling with seeds. Sesame seeds, poppy seeds and sunflower seeds are all great additions to these rolls. This recipe is adapted from Better Homes and Gardens New Cookbook. In a small saucepan, combine milk, sugar, butter, and salt. Heat just until warm, about 120 to 130 degrees. In your stand mixer, add 2 cups flour and yeast. Add warm milk mixture and eggs. Beat on low speed until combined, being sure to scrape down the sides of the bowl. Add your dough hook to the mixer, beat in as much of the flour as you can, I used 4 1/2 cups total flour. Knead on medium for 8 - 10 minutes, or until the dough is stiff, smooth and elastic. Cover the dough, and let it rise in a warm place, until it doubles in size. This will take about one hour. Then punch the dough done, divide it in half, and let it rise another 10 minutes. Shape the dough in 24 balls, or any other shape you want. Place the shapes on a baking sheet. Cover and let rise until they double again, another 30 minutes. Preheat your oven to 375 degrees. Bake the rolls for 12- 15 minutes, or until golden brown. Prepare as stated above, except after shaping the dough into desired roll shapes, you should place them on a baking sheet, and cover them loosely with plastic wrap. Store in the refrigerator for 2-24 hours, or freeze for up to 2 months. If frozen, defrost in the refrigerator first. Remove the rolls and let them stand at room temperature for 30 minutes prior to baking. Bake as instructed above. Any type of fresh bread is amazing to me. I had a hard time with self control when warm bread comes out of the oven, and I never regret it! 🙂 These rolls look amazing. Good luck at the bake sale! .-= Nicole (Making Good Choices)´s last blog ..Delivery! =-. and noone has her recipe…. Your rolls look stunningly soft! .-= Miriam/The Winter Guest´s last blog ..Broccoli, salmon and manchego quiche =-. These would go perfectly with some buttermilk as my breakfast! .-= Drick´s last blog ..Spring Chicken =-. My goodness there is no doubt these are so perfect you could sell them to a bakery, you should go into business these are gorgeous rolls, I cant imagine how you got these so perfect in shape and size congrats on this awesome job! .-= pegasuslegend´s last blog ..Deep Fried Hearts of Palm Recipe =-. .-= Rochelle (Acquired Taste)´s last blog ..Death by Chocolate, Chocolate Chip and Strawberry Cheese Cake =-. Very nice. Thank you for being so thorough with the directions. I think it’s often assumed that people understand certain steps that should be taken to ensure the quality of the end product. Since I have never taken formal cooking classes I appreciate all the added detail. Every bit helps. What’s better than buttery rolls…(except maybe topped with a bit of butter). =) YUM! These buns look really yummy! Beautiful photos, and a lovely recipe! I’m always looking for new dinner roll recipes! These look so delicious. I can tell they must have been fluffy little bites of heaven. These rolls sounds so wonderfully light and fluffy, excellent recipe! .-= 5 Star Foodie´s last blog ..Morel Fettuccine with Spinach Ribbons and Crispy Shallots =-. .-= redkathy´s last blog ..Creamy Peanut Butter Oatmeal Pie =-. Everything that tastes buttery is usually very good! Your rolls caught my eye, I would looove to have one of those for breakfast right now. .-= Linn @ Swedish home cooking´s last blog ..Swedish Home Cooking "Swedish Meatballs" =-. First Congrats on the top 9, I love this kind of bread, and I didn’t know it was so easy to make them, thank you for the recipe. I’ll try it soon. Thanks Angie, I made these yesterday and everyone loved them.They were also easy to make and smelled fabulous when baking. Absolutely hands down BEST yeast roll recipe. I have been testing different butter yeast roll recipes for Thanksgiving. I tried one that had hundreds of excellent reviews, and it was good. I tried this one today and it blew the others out of the water. The rolls have a thin crisp to the tops and yet are light and airy in the middle. Perfect!